A celebratory tribute concert and events to mark what would have been Fela Kuti’s 77th birthday are set to be held in London this weekend, along with the latest instalment of the extensive reissue campaign of Fela LPs, with six long out-of-print titles set to be reissued. The latest batch of records from the Nigerian Afrobeat pioneer to be repressed includes five key albums from Fela’s prolific mid-70’s period with his Africa ’70 group: Roforofo Fight (1972), Alagbon Close (1974), Everything Scatter (1975), Na Poi (1976) and Fear Not For Man (1977); along with 1989’s Beasts Of No Nation with the Egypt ’80 line-up. All records appear housed in artist Lemi Ghariokwu's iconic sleeves and come with a download and liner notes by Afrobeat historian Chris May. The records showcase a key period in Fela’s development of Afrobeat as a form of music and the political philosophy of the lyrics and were originally released on Nigerian labels. The albums will be available on vinyl from this Friday (October 16). The LPs follow 2013’s Knitting Factory Records reissues of Fela’s complete works to coincide with what would have been his 75th birthday (Fela died in 1997), with almost 50 original albums released over 26 individual CDs, as well as two volumes of the The Best Of The Black President compilations and a boxset of LPs curated by Brian Eno. For more information visit the new Fela website here. 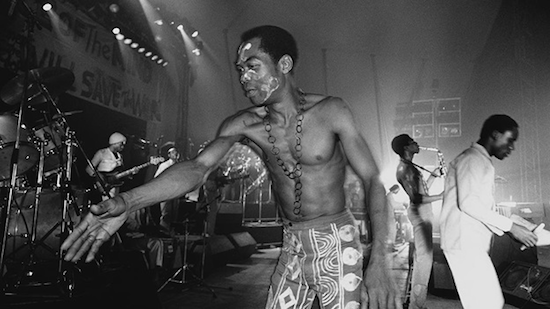 Fela Anikulapo Kuti would have been 77 on Thursday (October 15) and in addition to the album reissues, a celebratory tribute concert is set to take place in London on Friday (October 16), at the British Library. The lineup features former Egypt ‘80 keyboard player Dele Sosimi and his 16-piece Afrobeat Orchestra, plus long-time Fela drummer Tony Allen who was a member of Fela’s early highlife-jazz group Koola Lobitos and Africa ‘70 throughout the late 1960s and 70s. Over the evening they will be joined onstage by a huge guest list of artists inspired by Fela’s work, including 2face Idibia, Laura Mvula, Shingai Shoniwa, Afrikan Boy, Terri Walker and many more. Other Felabration happenings this weekend at the British Library include a talk from Lemi Ghariokwu about creating the iconic sleeves for most of Fela Kuti's albums earlier in the evening ahead of the Felabration gig (more information and tickets here). There will also be a screening of Alex Gibney's 2014 documentary Finding Fela, followed by live conversations with Fela's manager Rikki Stein and guests including Dele Sosimi, Tony Allen, Lemi Ghariokwu and 2face Idibia, on Saturday afternoon (October 17) (more information and tickets here). The concert coincides with the launch of the West Africa - Word, Symbol, Song exhibition tracing the written and oral history of West Africa for the past three centuries. Read Dele Sosimi talk about his time playing with Fela Kuti here.